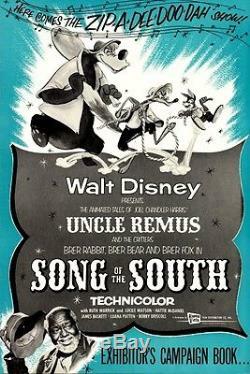 Walt Disney Pictures Pressbook for the film. 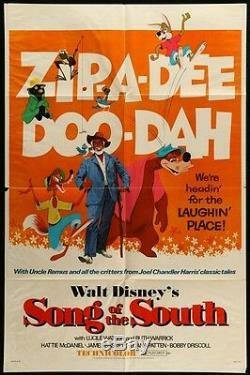 Bobby Driscoll, Ruth Warrick, Lucile Watson, Hattie McDaniel, James Baskett, Luana Patten. Pressbook has NEVER BEEN FOLDED. Aside from a few creases on the left side, this pressbook is in excellent (almost near mint) condition, it would be difficult to find a better example. 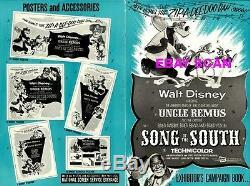 Nice sharp edges, sits very flat, wonderful Disney memorabilia that is surely to only gain in value. If you have been looking for a copy of this rarely auctioned pressbook in its best condition, this is it. 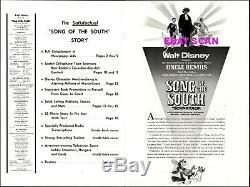 The pages of this pressbook are printed on a beautiful glossy paper. An original piece (NOT A COPY) of Hollywood nostalgia! This poster is NOT a copy or reproduction. The pressbook in all our auctions is the main item, because that is my specialty. These are photos of the exact extras included (the poster image can be enlarged). Most are quality pieces, but some may have defects. You may find pinholes or writing on the back (rare but it does happen). The odd piece may have a blemish, tear or crease or other issue. A few of the posters may have a rippled type area which can usually be seen in a scan but sometimes not, in this case there is some rippling on the poster. Posters are included AS IS! PRESSBOOK NUMBER OF PAGES: 18 SIZE: 12" X 18" YEAR: 1946 (1956 re-release). 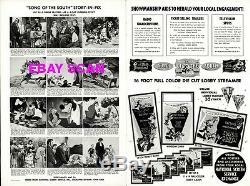 OVER 1,000 GREAT PRESSBOOKS IN MY STORE and more are added each week! ALL PRESSBOOKS ARE MAILED WITH A COLLECTABLE PLASTIC COVER AND IN A LARGE STURDY CARDBOARD AND ALL ARE MAILED UNFOLDED!!! THERE IS A CHOICE OF MAILING SPEEDS. You will note I have a few negatives now. The feedback that I have received that is negative (3 out of about 1,050), one person never contacted me that they were sent a pressbook with a cut in it (by mistake). I certainly would have corrected the problem immediately if they had just told me. If you have a problem, PLEASE contact me and I will do everything I can to correct an error. This is my personal pledge to all of my customers. ABOUT ME: I have been a movie fan all of my life, my grandfather worked for both Universal and RKO, and my mother was an editor at Paramount. At age 8 I was taken to the offices and saw piles of pressbooks stacked up. 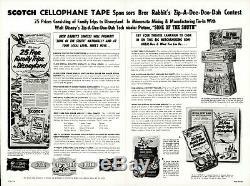 I loved the pressbooks as they had many pages of information of these movies and such great old movie advertising and could be read many times over. I have collected since I was 8. When I obtained a pressbook, it would immediately go into a plastic bag and was taped shut so no air reached these. 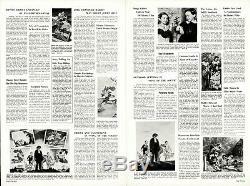 WE HAVE THE WORLD'S LARGEST SELECTION OF MOVIE PRESSBOOKS FOR SALE. 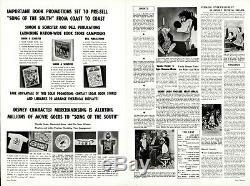 WE SPECIALIZE IN ONLY MOVIE PRESSBOOKS AND HAVE HAD OVER 40 YEARS OF EXPERIENCE WITH THEM. 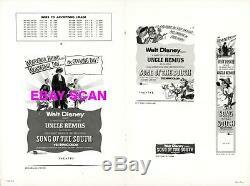 The item "SONG OF THE SOUTH pressbook, WALT DISNEY, Bobby Driscoll, Ruth Warrick +POSTER" is in sale since Wednesday, March 20, 2019. 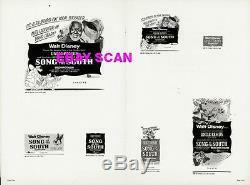 This item is in the category "Entertainment Memorabilia\Movie Memorabilia\Pressbooks\1950-59". The seller is "treasuredcinema" and is located in Eveleth, Minnesota.